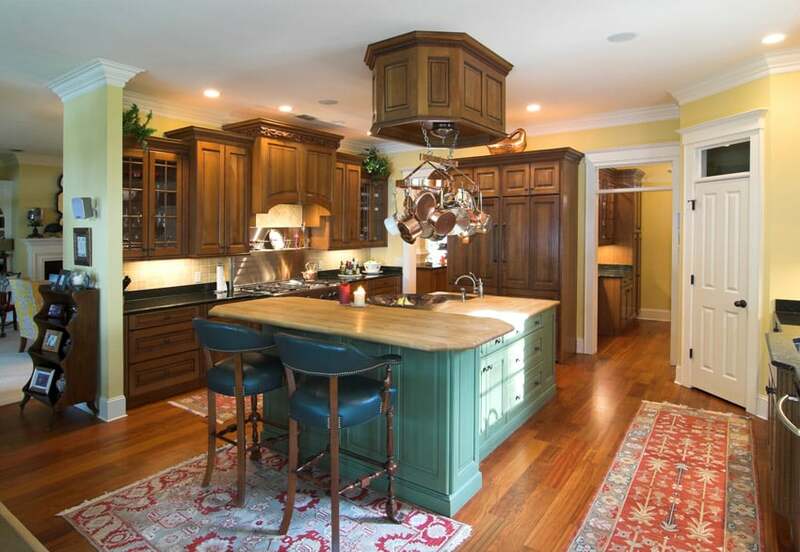 Welcome to our gallery of traditional kitchen designs. Traditional kitchens feature a formal and elegant look that also combines warm and classic elements to create a design that appeals to all types of personalities. Taking its influence from American and European homes of the 19th and 20th centuries, traditional kitchens use a variety of styles for inspiration. Traditional design styles include Early American, Victorian, Neoclassical, French, Georgian, Edwardian, Federal, Regency, Italian, and Old World. Within these designs you can expect to see decorative cabinetry, ornate molding. detailed trim and a mix of textures and colors. Featured in the image above is a traditional style kitchen with a refreshing appeal as it mixes 2 different finishes for its kitchen cabinets. Some cabinets were duco varnished in aged walnut, while some are in matte white finish. The combination of finishes is refreshing and being of neutral tones, an excellent match with the bold orange-painted walls of the kitchen. The countertop material of choice is marble, paired with glossy white ceramic tiles for the backsplash. The ebony solid wood floors used in this kitchen helps emphasize the beauty of the light-colored furniture pieces used in the space. The space has an open layout, with the kitchen directly connect to the formal dining area. The walls were painted in a light oatmeal color with white moldings and white paneled ceiling. Similarly, the kitchen has a traditional profile style which also has a white finish and topped with white marble for an elegant working counter. The backsplash uses light cream mosaic tiles giving the surface a light but elegant finish, and you will also see a lower counter attached to the kitchen island with solid wood butcher’s block top. The combination of colors and finishes creates an over-all bright and light feel to the space. The use of a combination of black and white kitchen cabinets create a very simple yet elegant look. This traditional style kitchen has white paneled kitchen main cabinets and a slightly distressed black paint finish for the base of the kitchen island. The counter top material used contrasts with the base – black marble was used with the white base and white marble for the black base. The alternation of colors creates balance and harmony in the design. A lovely contemporary adaptation of traditional style kitchens. This uses paneled kitchen cabinet doors placed on modular units, in white matte finish for that clean classic look. This is combined with gorgeous Alpine White granite counter top which adds a bit of texture and contrast, and marble subway tiles for the backsplash. Additionally, there is also a bar counter space with 2 white barstools and a modern pendant lamp hanging above it. A neo-classic kitchen which was inspired by classic roman design and motifs. The kitchen is fairly large, with light yellow cream walls and matching polished ceramic floor tiles. The solid wood cabinets are in beech wood finish, giving it a slight orange tinge, while the cream-colored Alpine White granite counters matches the color of the walls. To add more variety, the barstools are in mahogany finish, adding a subtle contrasting element to the space. Reds and oranges abound in this classic kitchen design. Orange tones are found on the solid Teak wood floors and the light cherry wood main kitchen cabinets with orange granite counter top, while the massive kitchen island uses redwood with light beige Bordeaux granite. The cooking area has a more rustic feel to it as it has an exposed wooden beam on its ceiling area, and is in between two columns clad in stone masonry. The cooking area with its Wolf six burner stove also uses black granite and exposed terracotta bricks with a bras metal medallion accent at the center. 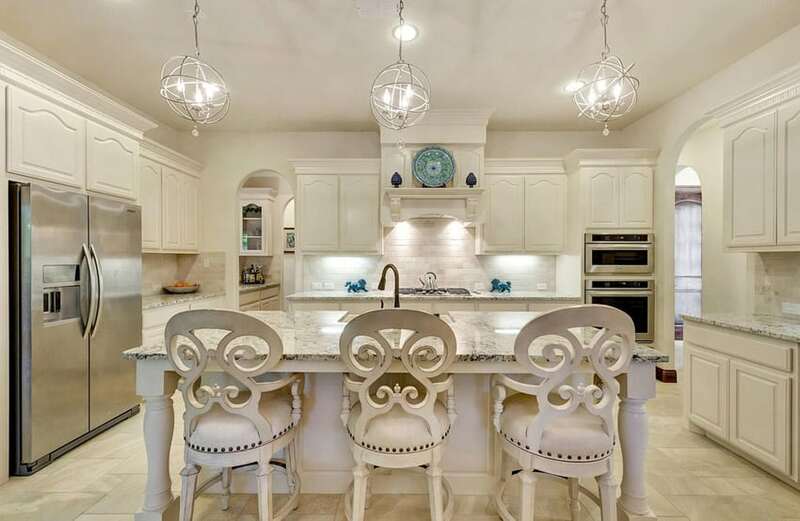 This dominantly white kitchen exhibits a divine and attractive feel with its choice of color, lighting, and space. The overhead and base cabinets are in solid white with simple panels and a round knob for the handle. The backsplash and classic kitchen island base that is supported by four pillars are also in white. The countertops, walls, and the ceiling add a very subtle light oatmeal color, adding a good touch on dimension and depth. The floor, on the other hand, is lined with glossy deep mahogany laminates; adding contrast and strength to the mostly light feel of the room. 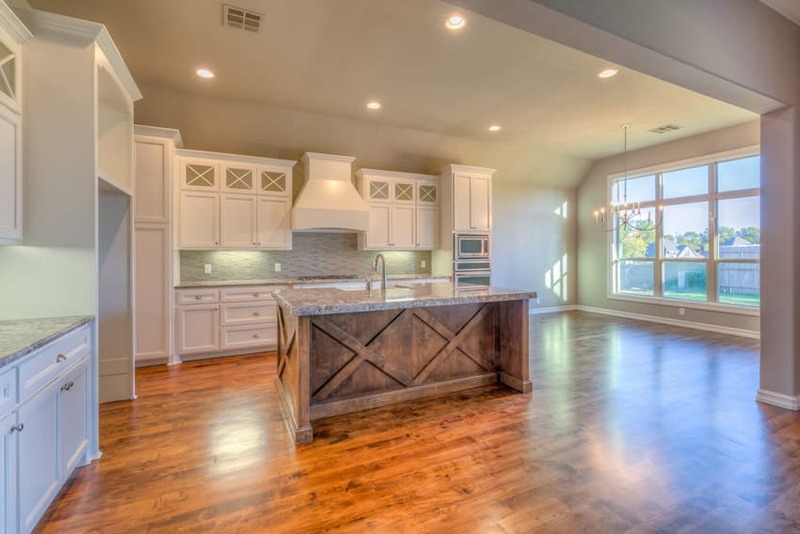 Dark wood floors really help bring out the white finish used on the kitchen cabinets.You will see that the kitchen cabinets maximized the available ceiling height, and also maximized all available wall space and placed kitchen counters and overhead cabinets where there is space. 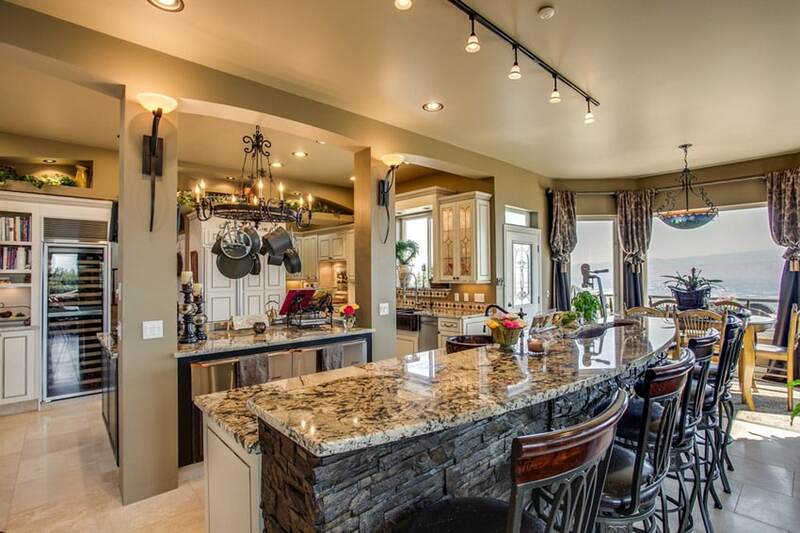 It also manages to place a bar counter with enough space to accommodate 3 bar stools. Paired with the white cabinets were white ceramic tiles for the back splash and white granite, creating a clean and light look which helps balance out the heavy look of the dark wood floors. Beautiful white cabinets line the walls of this kitchen with a stainless steel oven and a beautifully patterned solid gray stone backsplash that matches the Carrara marble countertops. In contrast to the white cabinetry by the wall, the kitchen island’s base is solid gray and holds a stainless steel sink. Two pendant lights that hang by solid gold chains and an inverted bell shaped metal frame that holds a glass lie directly above it. The flooring is covered with wengue stained wood in a matte finish. This kitchen is a bit smaller but manages to maintain a light feel as it uses off-white kitchen cabinets. These cabinets have panel detailing and maximizes the ceiling height to create more storage space. The upper part of the overhead cabinets were converted into a display cabinet, using wood-framed glass doors. The very dark ebony wood floors brings out the white finish of the cabinets well, while the stone counters add a touch of warm color to the space. Big doors & windows definitely contribute a lot to the over-all feel of any indoor environment. 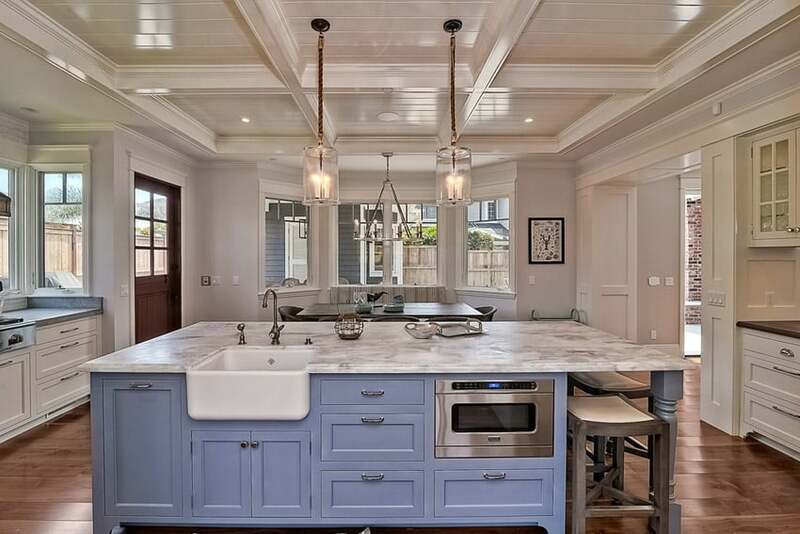 This kitchen is really bright and well-lit, to add to the fact that the main kitchen cabinets is white and the walls were painted a soft sky blue color, giving it a refreshing feel. 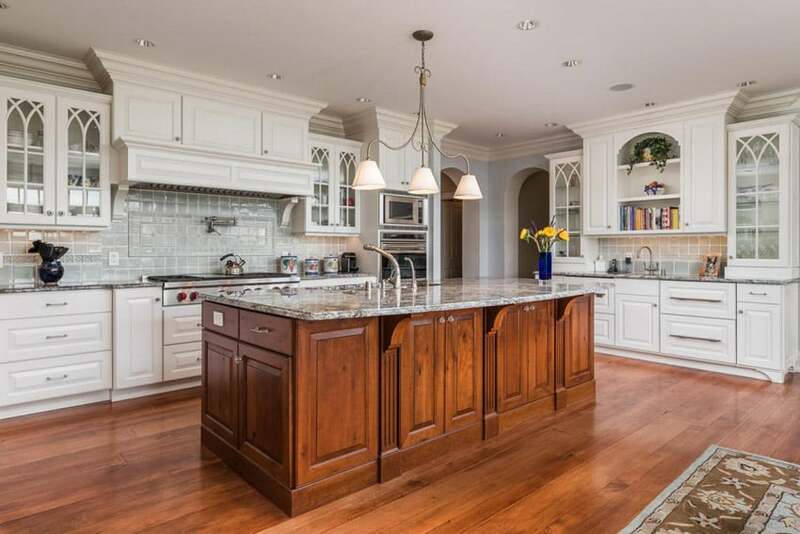 The kitchen cabinets give a modern take on Gothic cabinet detailing, combining glass with the the Gothic arch mullions. The kitchen island is a contrast against the white main cabinets as it has a natural teak wood finish and a more crisp, neo-classic inspired cabinet base. 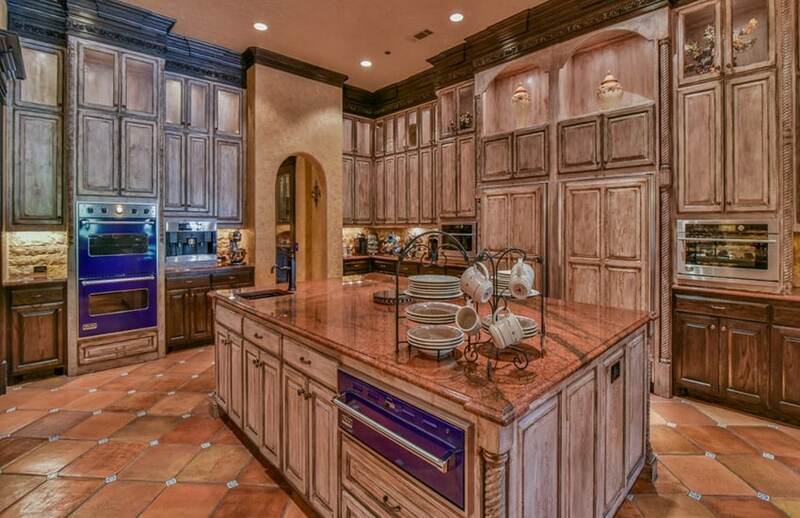 This kitchen has a more old-world feel to it due to the choice of finishes. The kitchen space has a high ceiling and light gray walls, paired with cream-painted kitchen cabinets with white Calcutta marble counter top and back splash. The yellow tone of the cabinet paint somehow give it an aged appearance, even more enhanced by the use of iron chandelier with warm white lights, emphasizing the yellow/orange tones. 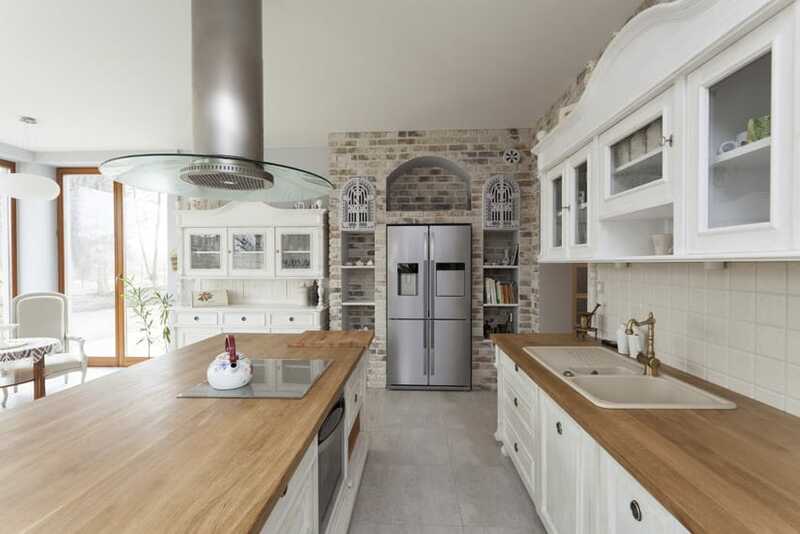 The brick divider wall adds both texture and personality to this kitchen space. 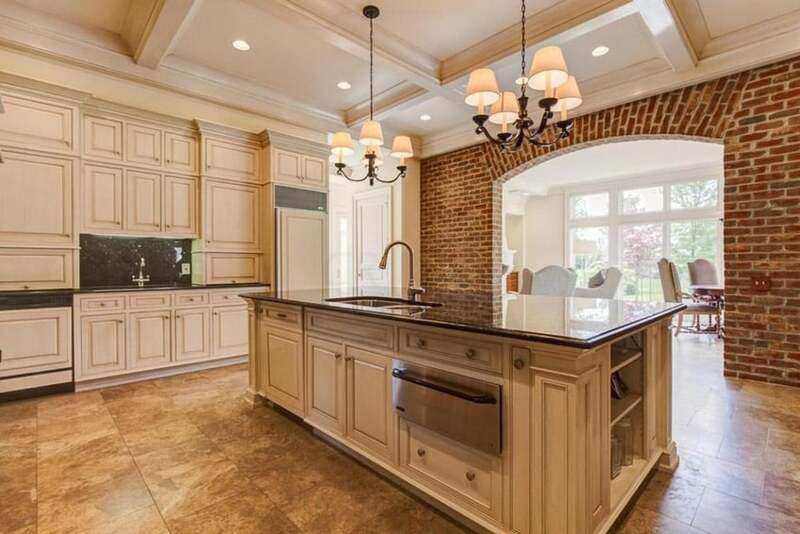 This brick archway divides the kitchen from the dining areas, but the large opening allows the natural lighting from the dining area to seep through the kitchen. 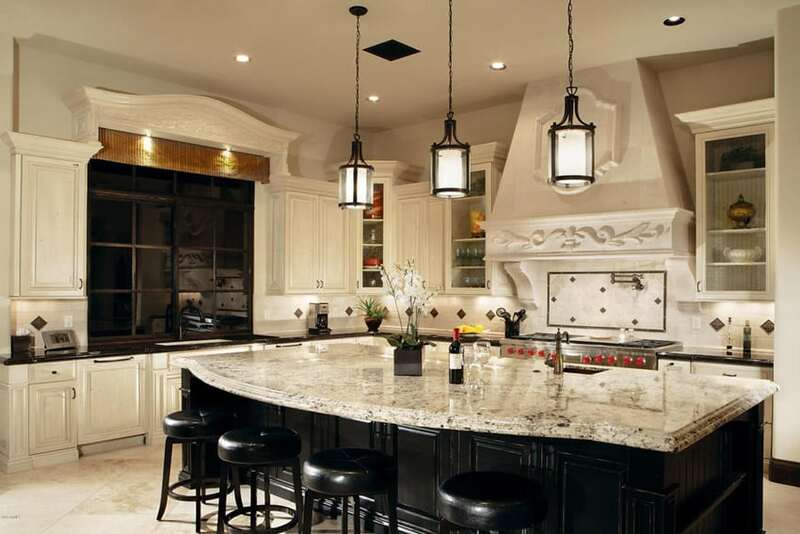 The kitchen itself is a simple traditional style kitchen – it uses light beech wood kitchen cabinets and black granite counter top, has a rectangular kitchen island at the center with two lamps, and walls painted in a light oatmeal color. Another traditional inspired kitchen, but with a more modern retro look. 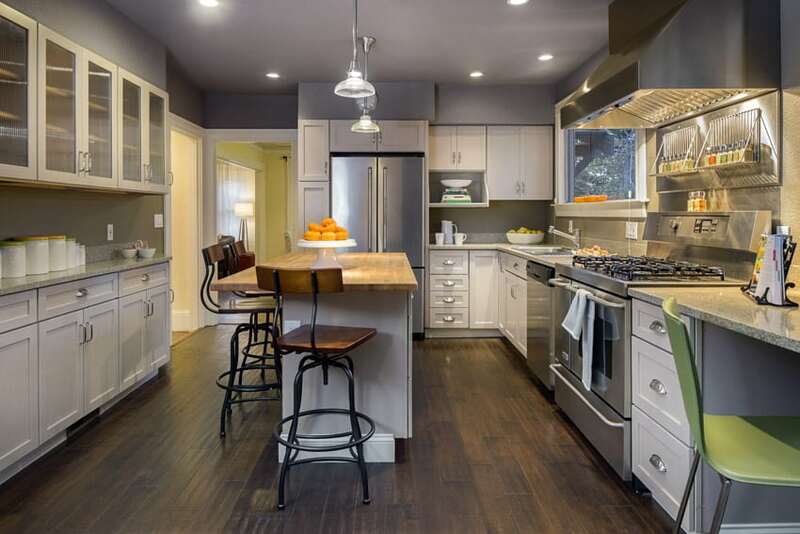 The wooden floors were painted in black, helping bring out the color of the kitchen cabinets. The main kitchen cabinets have white paint finish, while the kitchen island favors a mint green paint, giving it a unique and sweet look. All counter tops and back splash uses white marble, while metal elements are in gold or brushed bronze to complete that retro modern look. This kitchen is not that large. but the high sloping ceiling makes it look more spacious than it really is. With traditional-inspired kitchen cabinets, this kitchen has a universally-appealing look which is light on the eyes and has a refreshing tropical feel. 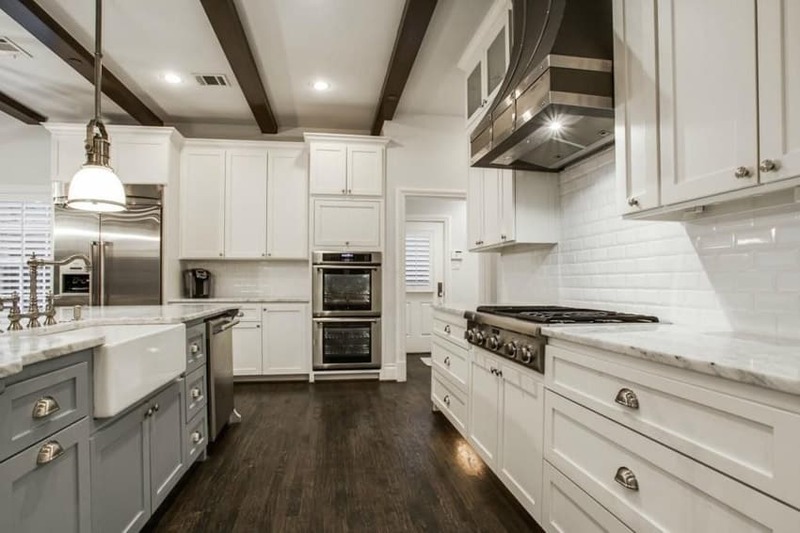 Walls were painted in a light gray color, while the kitchen cabinets are all in white. The main counter uses black solid surface, while the kitchen island uses a thick slab of polished sandstone. The kitchen island also accommodates 3 industrial-style metal bar stools with wooden seats. 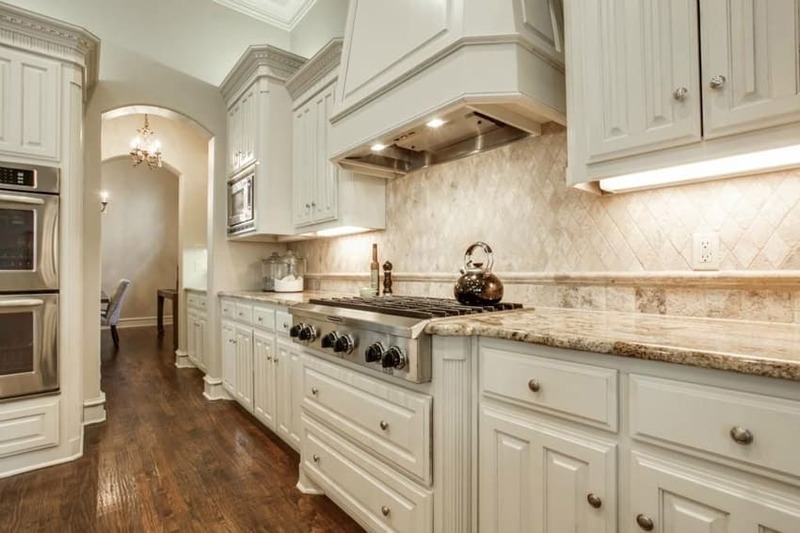 This traditional kitchen has a beautiful Emperador marble countertops that look great with the cream color of the cabinetry and taupe wall paint. Beautiful pendant lights give this room a more contemporary feel, especially paired with the chevron pattern ceramic wall tiles. The wide oak plank flooring, plank ceiling, rustic sliding barn door and farm house sink give this space a more country style. This kitchen is of a transitional style. 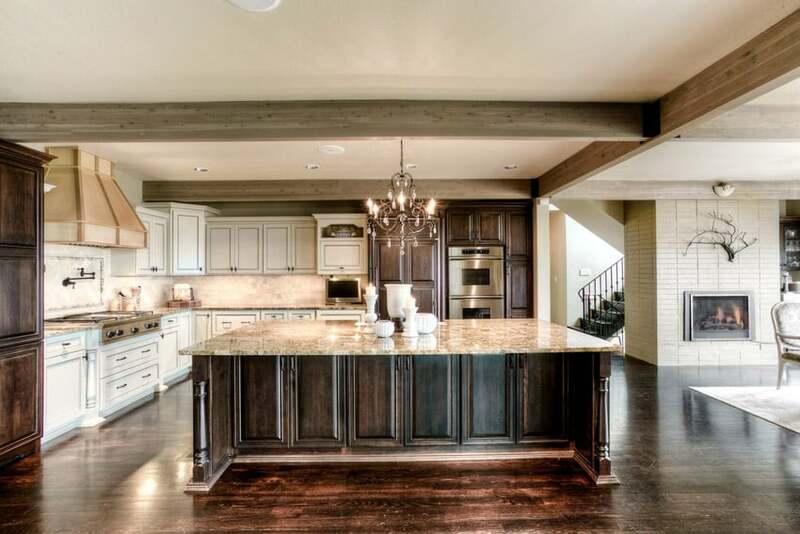 It uses traditional-inspired kitchen cabinets and combines it with more modern details/materials/finishes. Typical of transitional style spaces, the walls were painted in a light gray color, helping highlight the white main kitchen cabinets. To add variety, the kitchen island base was finished in a gunmetal gray color, combined with pine wood and solid dark mahogany butcher’s block counter top. The mosaic tiles adds interesting texture to the walls, while the iron pendant lamps adds an nice antique touch to the space. The use of traditional-style cabinets gives a classic touch to any modern space, giving it more dimension and depth compared to using plain-faced cabinets. This design is an excellent example of such. 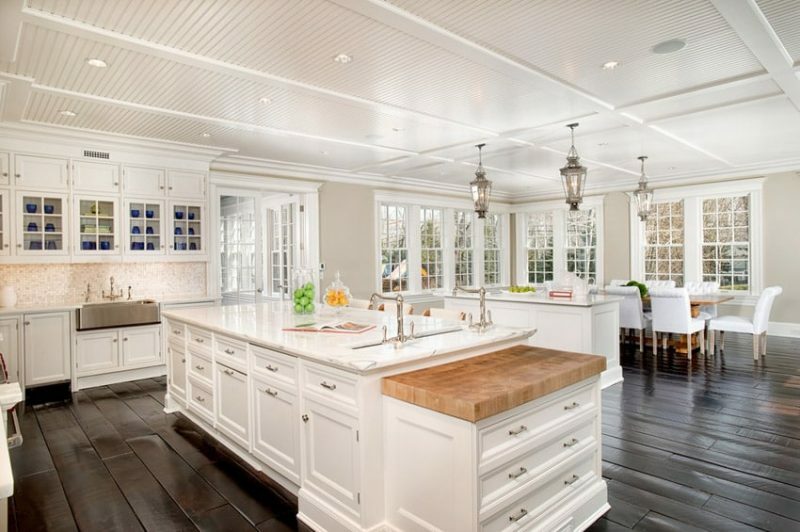 Placed in a modern space with an open floor plan, white-painted traditional-style kitchen cabinets were used. Satin finish black marble looks sleek and simple when paired with the white base and helps it balance the look. The backsplash is given additional texture with the gray slate stone tiles, while the solid mahogany floors effectively adds a warm glow to the space. 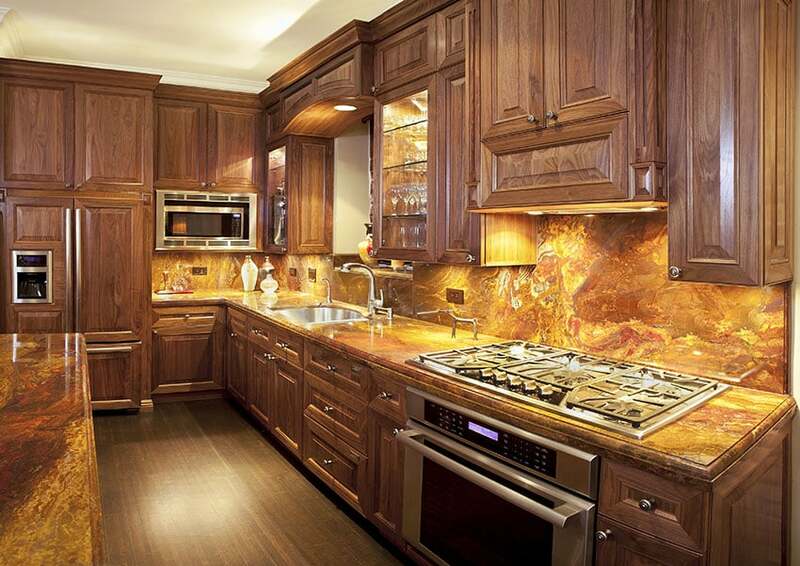 This kitchen definitely looks elegant and classy with its use of different dark wood finishes. This is placed in a transitional style interior with an open floor plan to make it look bigger. 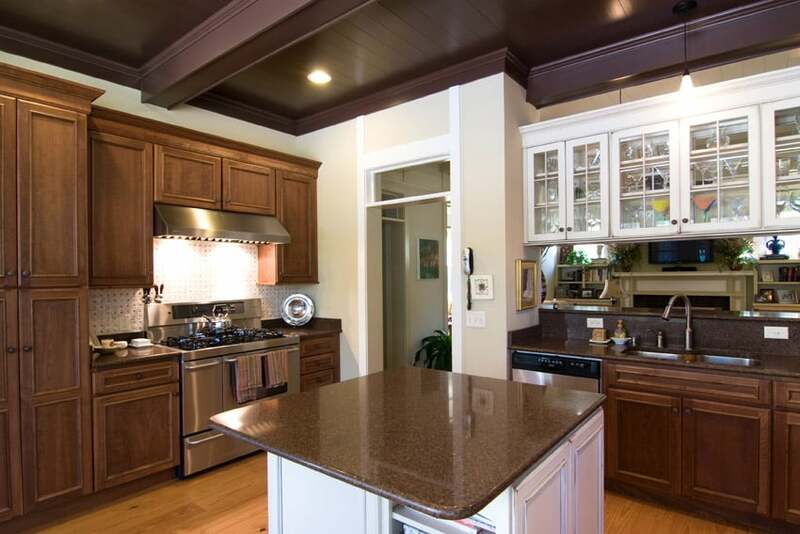 For this kitchen, dark solid mahogany was the material of choice of the kitchen cabinet. This is paired with white marble counter top and beige granite counter top or the kitchen island. On the back splash, marble finish beveled subway tiles were used, matching the counter top and giving it a very elegant look. The brown leather-upholstered bar stools also adds to the over-all elegant appeal of the space. 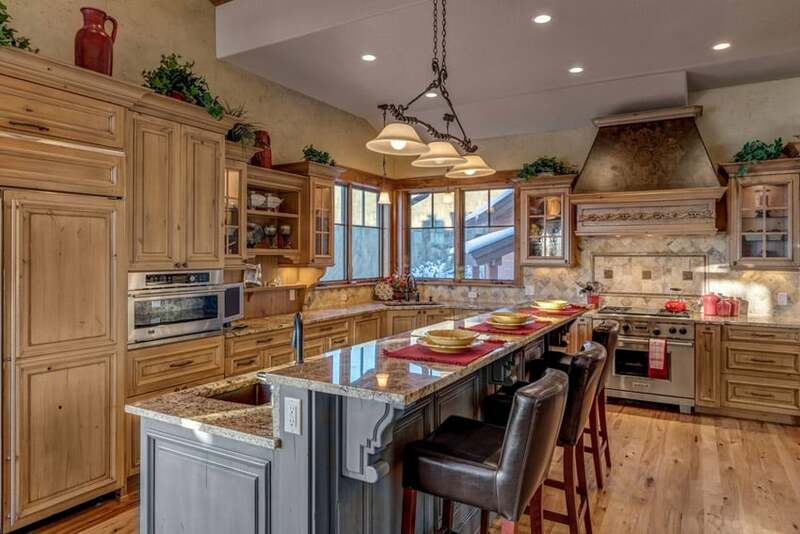 This kitchen features a more modern take on traditional style kitchen cabinets. The paneled cabinet door and drawer faces uses a simpler and profile to give it a cleaner, more modern look. Main cabinets and in white, while the kitchen island uses light slate gray base, but both uses white marble counters. The plain white beveled subway tiles used on the backsplash helps add depth, pattern and texture to the space, while the ebony wooden floors gives the space an excellent contrast. 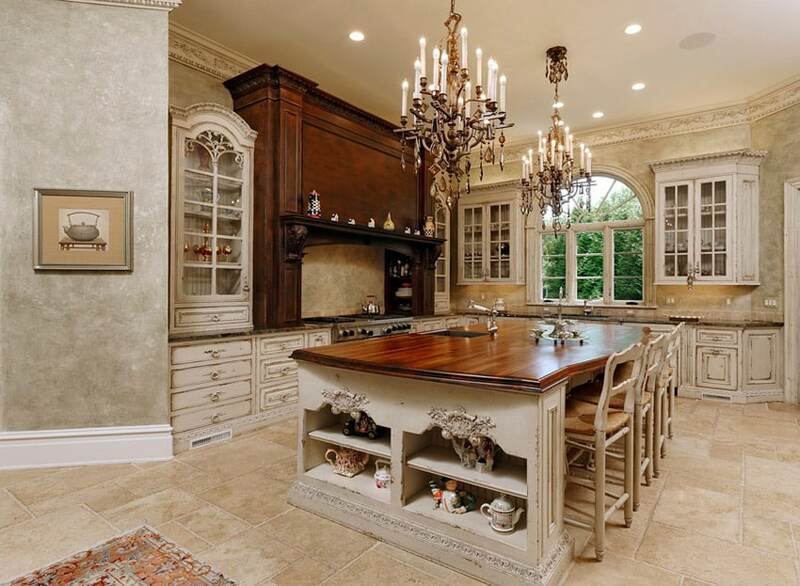 This is a truly traditional kitchen space with detailed carvings and classic motifs. 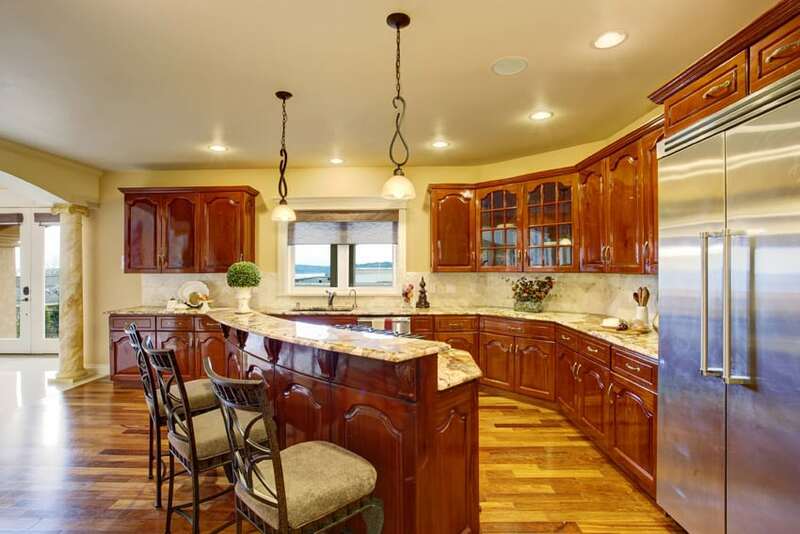 The kitchen cabinets are all in solid dark mahogany, giving it a really nice dark red tone. For the counter top and the back splash, a thick slab of dark olive granite was used, giving it a heavy yet elegant appeal. Despite the dark color choice for its finishes, it is all balanced as the space has good natural lighting, and uses light cream on the walls and on the floors, making the space look big and bright. This space blends a modern architecture with traditional-inspired interior elements and furniture pieces. 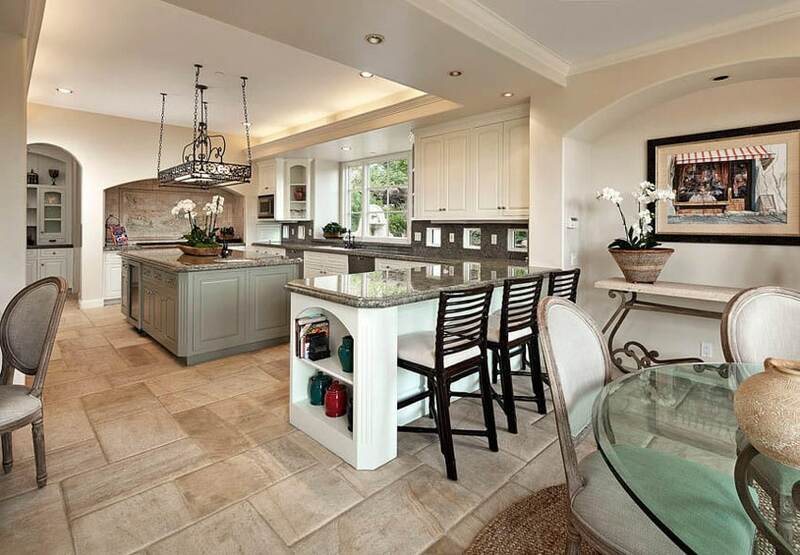 The kitchen featured in this photo is fairly small, but is placed in a open layout, making it look big and lighter. The white walls and light gray floor tiles give a nice neutral background to help the kitchen itself take the center-stage. 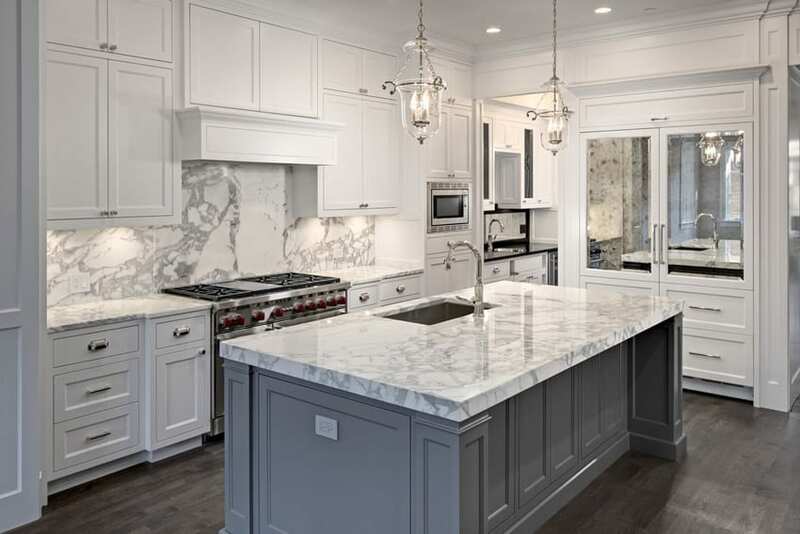 The cabinets are all in white with a simple paneled profile, and instead of using natural stone or solid surface for the counter top, it uses solid light walnut butcher’s block with a satin finish sealant and coating, making it look lighter and softer. This is mixed with retro-inspired elements like the ceramic kitchen sink and matte gold faucet. This kitchen combines white painted and walnut cabinets in an interesting way. 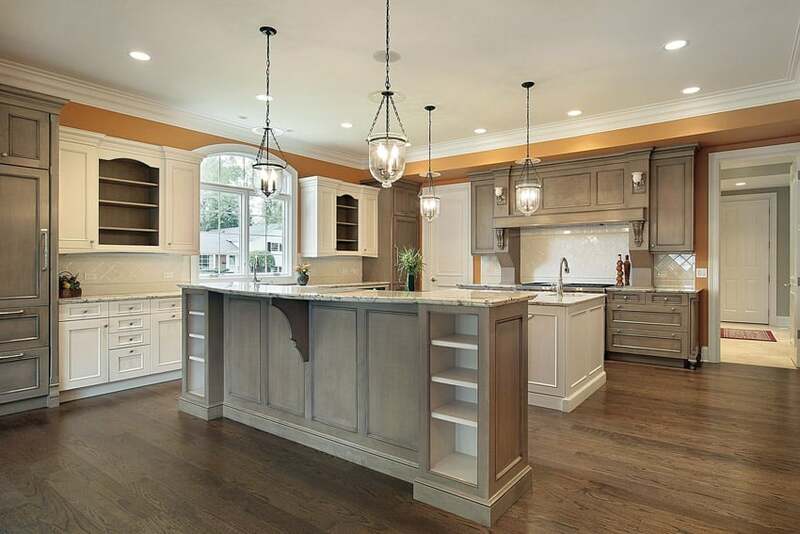 On the left side, the full set of kitchen cabinets are in walnut finish, while on the right side, the walnut base cabinets were paired with white overhead cabinets which uses French panel doors with clear glass. The kitchen island, on the other hand, uses white base with brown granite counter, which is also used on the both of the main counters. 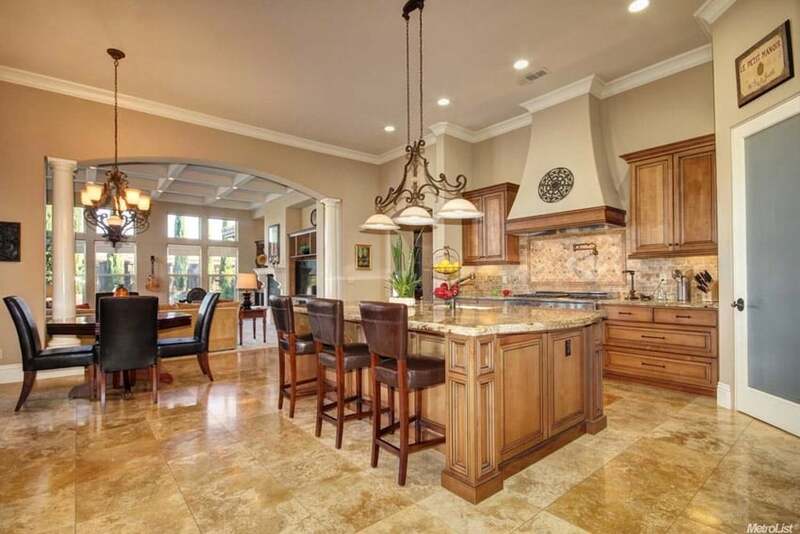 Golden hues are very much celebrated in this transitional style kitchen. Walls were painted in a golden yellow color, while the granite used also has a golden yellow color to match. Kitchen cabinets, on the other hand are white with silver pulls, while the L-shaped kitchen island uses maple wood finished base cabinets. The use of warm colored lights also help emphasize the golds used in the space. 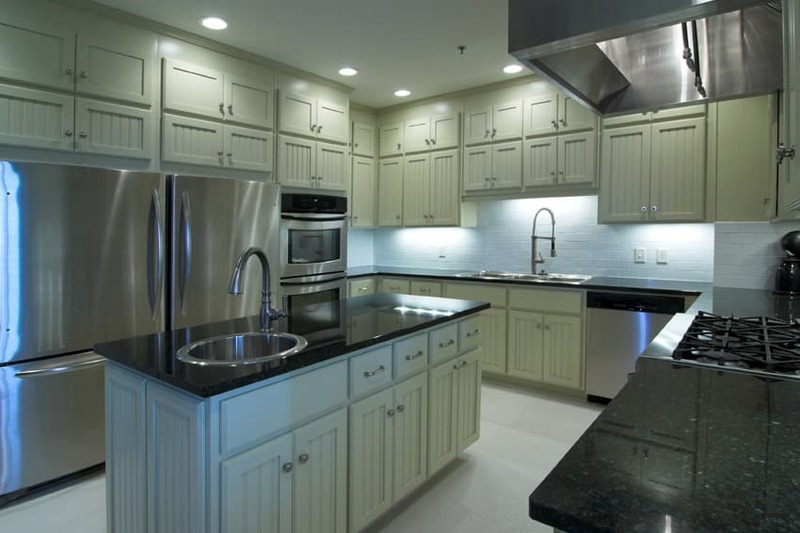 A fairly large kitchen space which used glossy finished Mahogany cabinets in favor of a more popular matte finish. 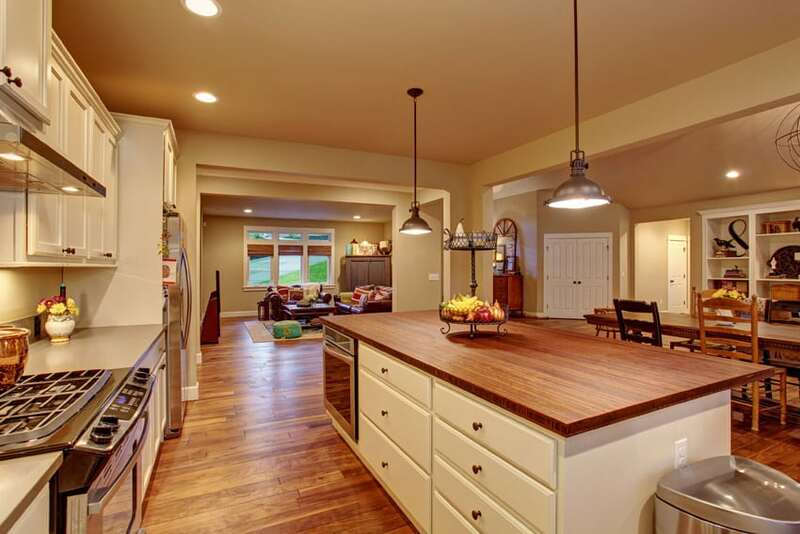 The overall environment of the kitchen has warm mood due to the yellow tone of the wall painy and the wood floors. 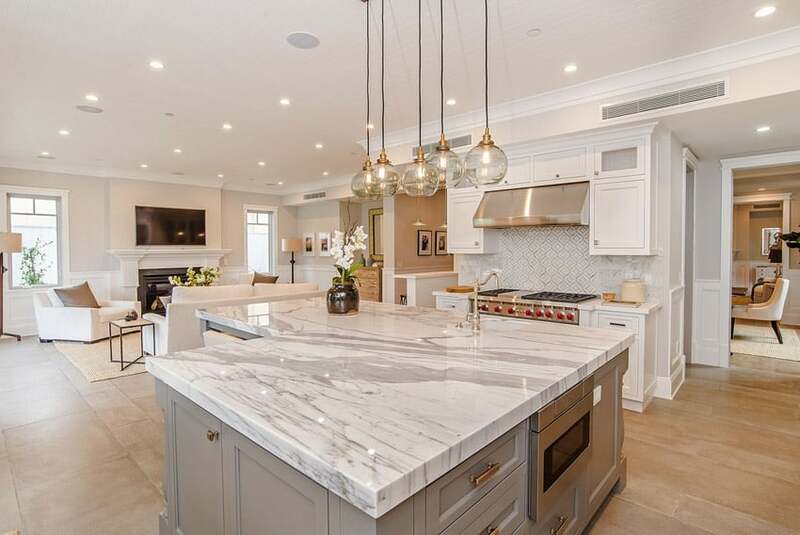 The counter top used is cream toned marble to match the light yellow walls while the the back splash is white marble, providing a neutral transition between the counter and the walls. 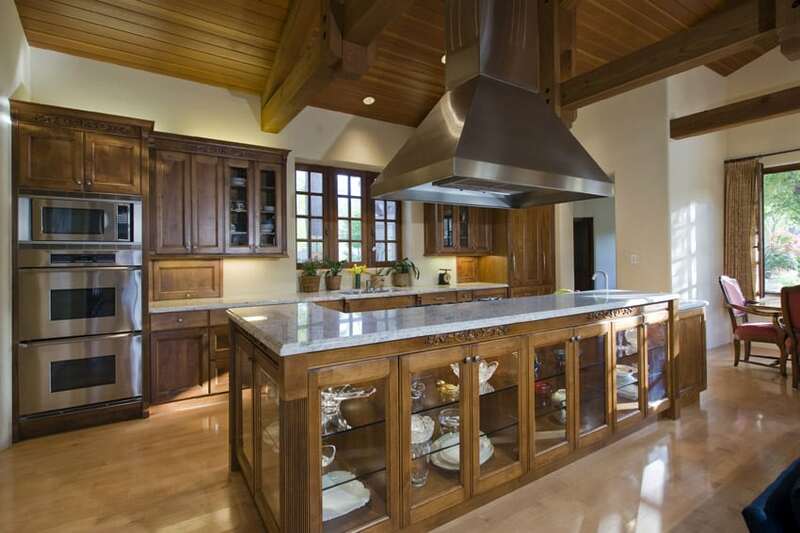 The Mediterranean architecture provides this kitchen the luxury of a high ceiling, making it look more spacious. You will see arched niche details on the walls, adding to the Mediterranean vibe of the space. For the cabinets, dark oak wood was used. This was topped with beige granite slab for the counter top and light cream ceramic tiles for the backsplash. 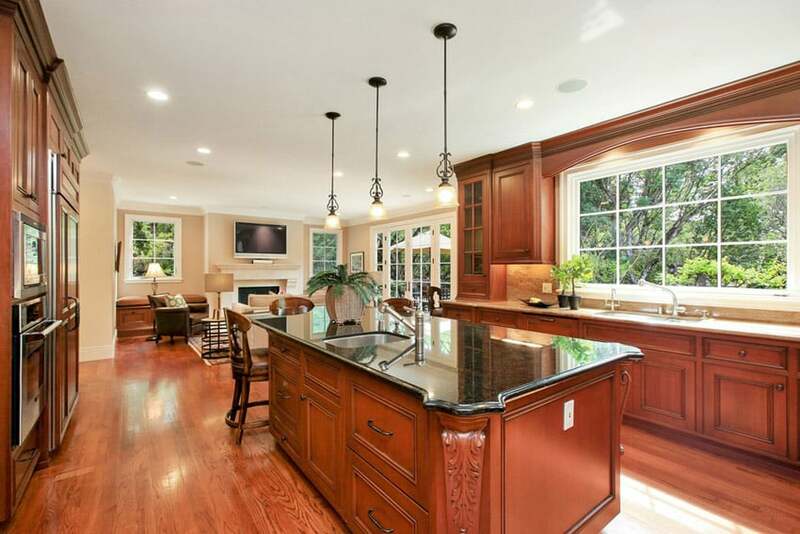 High ceilings and large windows enhance the overall appeal and grandeur of this traditional kitchen. 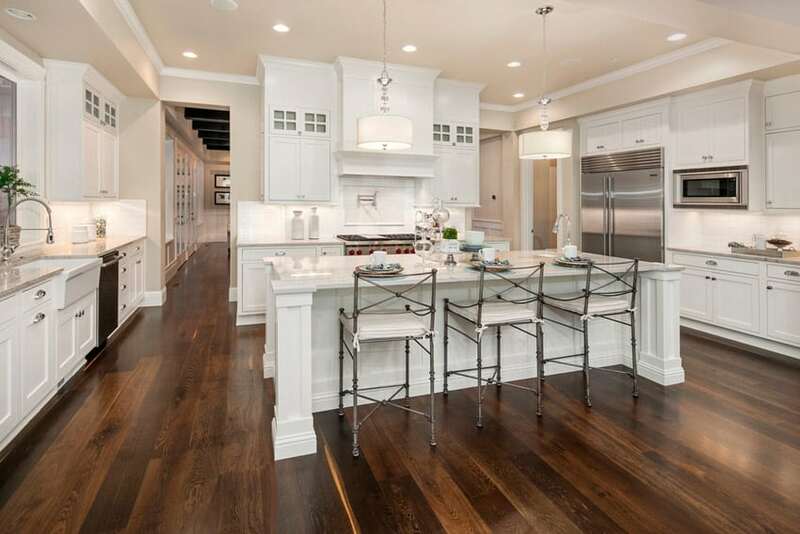 Dark cherry wood floors provide texture and a dark base, which helps bring out the color of the kitchen cabinets. The kitchen cabinets are of traditional style in a light beige color which is a great match with the oatmeal painted walls. One wall was used as a full storage cabinet, maximizing the available kitchen space and providing an efficient storage provision. 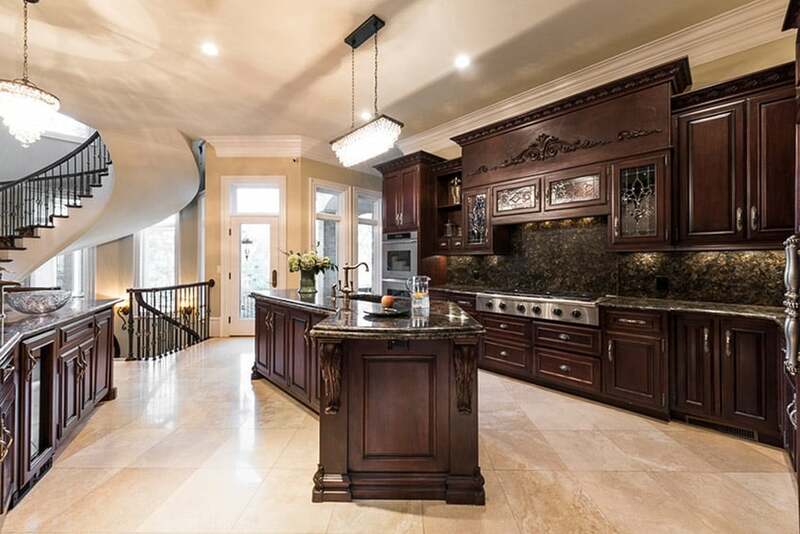 A gorgeous hand crafted copper oven hood highlights the high-end six burner stainless steel stove. 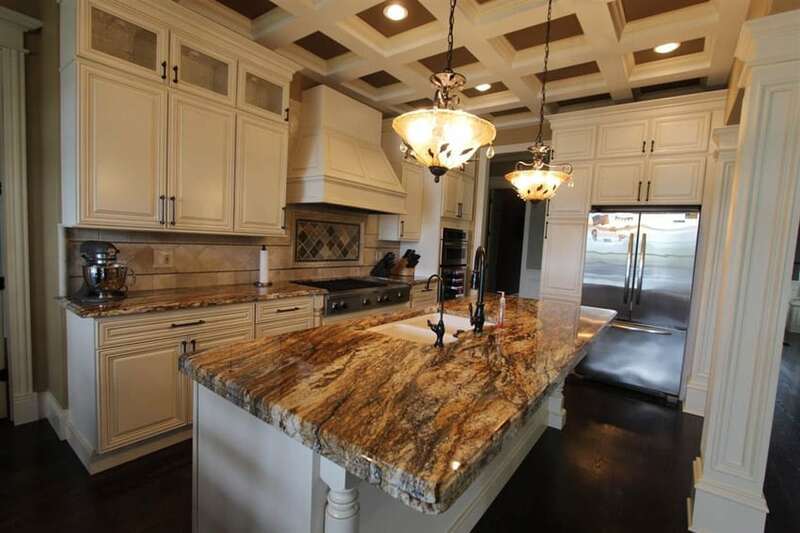 The countertops are a rich Calcutta Gold granite that are both functional and beautiful. Floral motifs and sinewy lines give this kitchen that art noveau look. 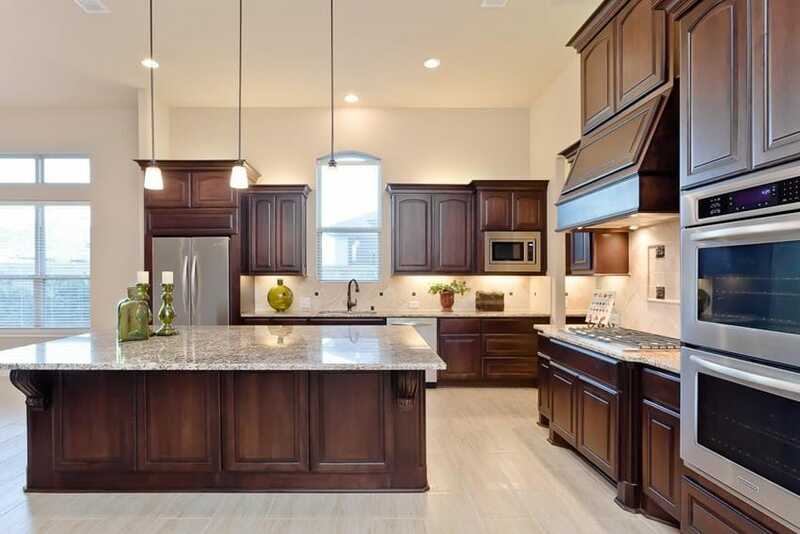 These kitchen cabinets are in an antiqued white finish and paited with dark cherry wood counter top (kitchen island) & black granite (main counters). 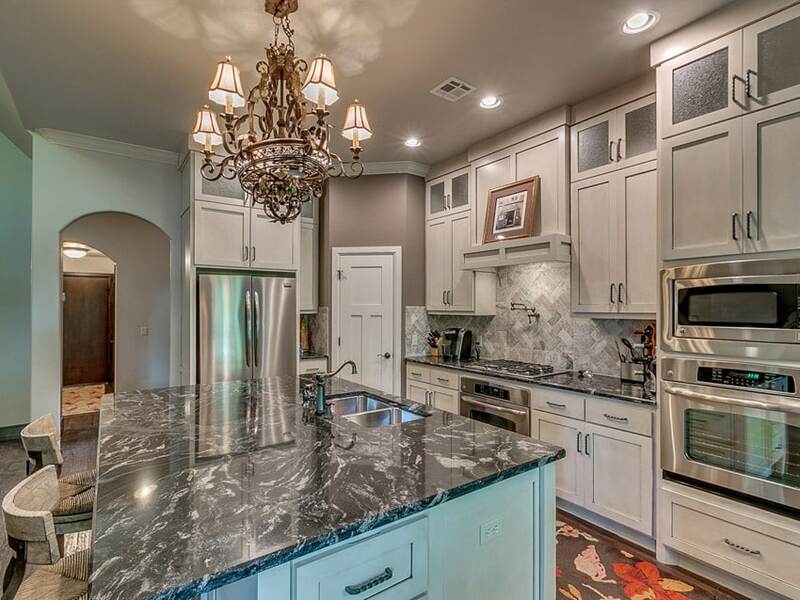 The antique chandeliers above the kitchen island adds both elegance and sophistication to the overall design, while the marbled finish of the wallpaper used gives that matching classic touch. A baroque style kitchen which uses dark colors and wood finish to create a dark yet elegant look, typical of baroque style interiors. Floors are solid dark Mahogany with prominent natural texture, while the walls uses a dark green wallapaper with yellow gold brocade pattern. You will also notice the ceiling which has various carvings and molding details, contributing to the overall authenticity of this baroque kitchen. All cabinets are in dark walnut paired with cream marble and light cherry butcher’s block. Iron chandliers were also used, providing a nice warm glow to the space. 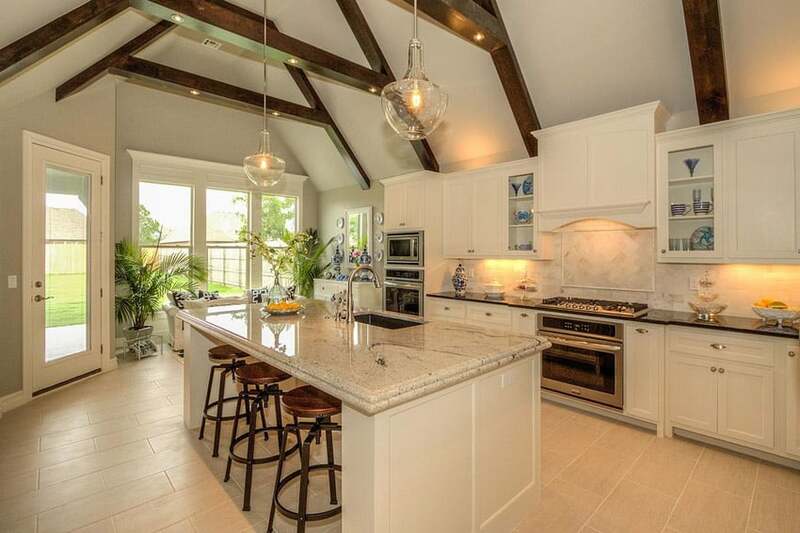 This beautiful kitchen has a glossy white ceiling with exposed trusses. Ample lighting is allowed inside the kitchen from the windows that surround it. The base cabinets by the wall are wide with metal handles, while the are overhead cabinets on one side with glass panels have stainless steel knobs. These surround the lavender kitchen island with a Carrara marble countertop and a white sink. The flooring is covered with wooden laminates. French provincial-inspired kitchen cabinets were combined with modern details to create this look. Walls were painted in a dark yellow beige color, providing a nice contrast against the white cabinets. 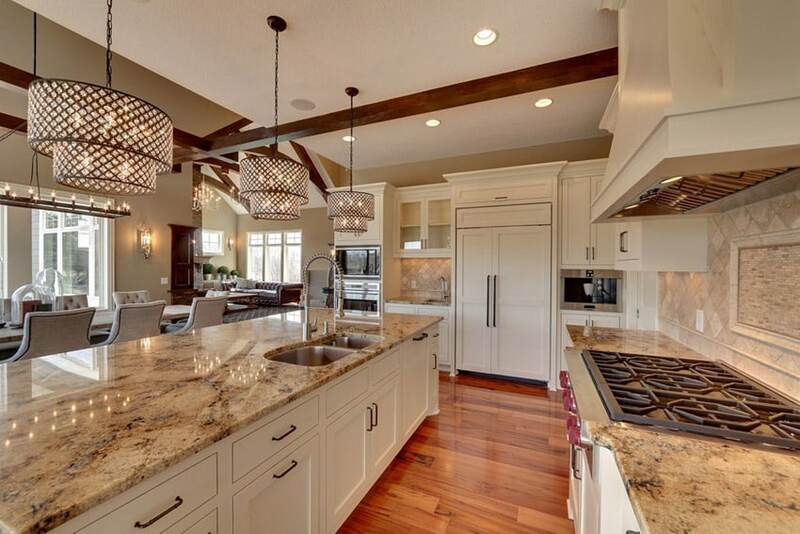 The counter top used is light cream granite with white ceramic tile backsplash tiles. 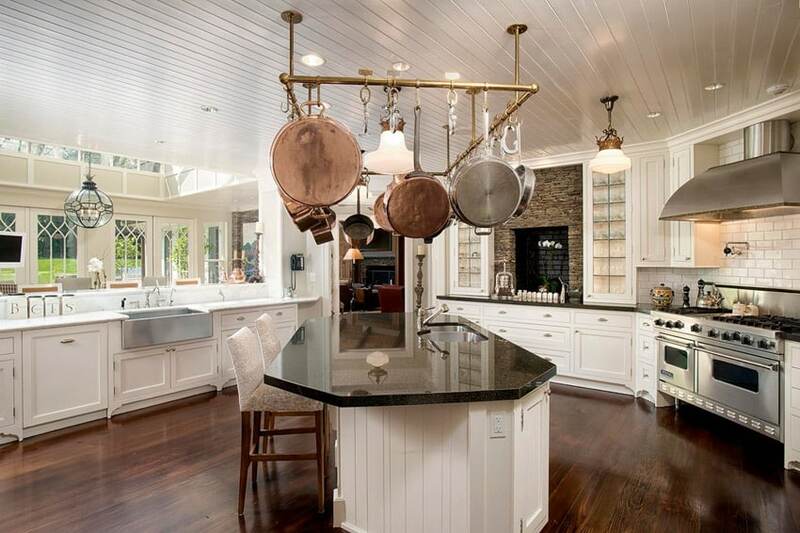 Above the kitchen island is a modern drum light in gold with pierced details. You will also see a floral wall installation on one side of the wall, giving the space a modern update using modern accessories. This kitchen has a more relaxed tropical feel due to the exposed slope ceiling with wood slats and trusses, as well as rattan finish furniture pieces. The kitchen is of traditional style with various finishes. Side cabinets are in white finish, while the center ones are gray and the kitchen island is in dark Mahogany. All of these were topped with black granite to make it more uniform, while the backsplash is gray nosaic tiles all over the walls giving it a nice pattern and texture. Large windows and doors provide this kitchen lots of natural light. Floors are solid walnut, while walls is a combination of light gray and light yellow. The kitchen also has an open layout and is directly connected with the living area. The traditional style kitchen cabinets was given a modern gunmetal gray finish while the kitchen island keeps its white base cabinet finish a classic Mont Blanc marble counter top. Another transitional style kitchen with an open layout which connects the kitchen with the dining area. 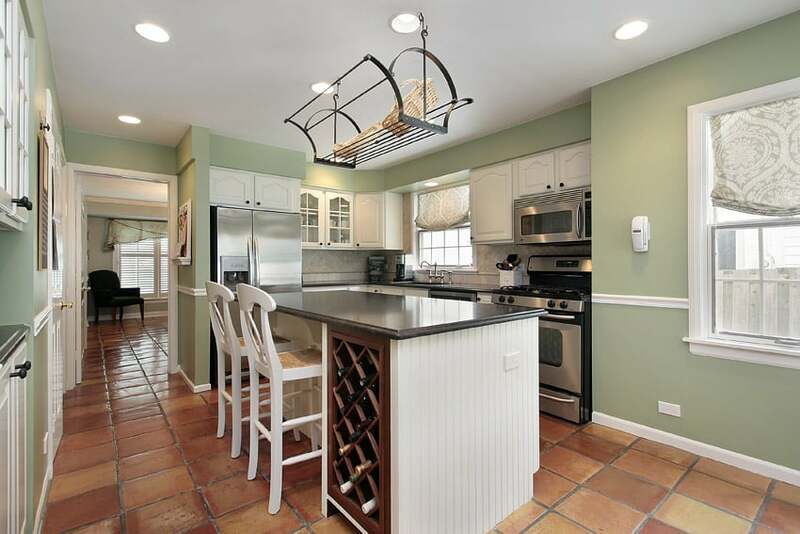 The main kitchen cabinets are white with horizontal louvers, while the kitchen island is painted in warm sage green. All counters uses beige granite counter top for a more uniform look, while the wrought iron chandelier adds to the authentic traditional look of the kitchen. This kitchen creatively plays with varying shades and textures of brown to add personality to this kitchen. The cabinets are textured and matte, overing most of the kitchen walls except for the walls surrounding the arch for the entrance. The countertop on the wide rectangular kitchen island is a glossy red brown stone with a functional base that is covered with cabinets. Brown diagonal tiles in varying shades of warm brown cover the flooring. The only odd color in this space are the purple ovens with stainless steel accents. 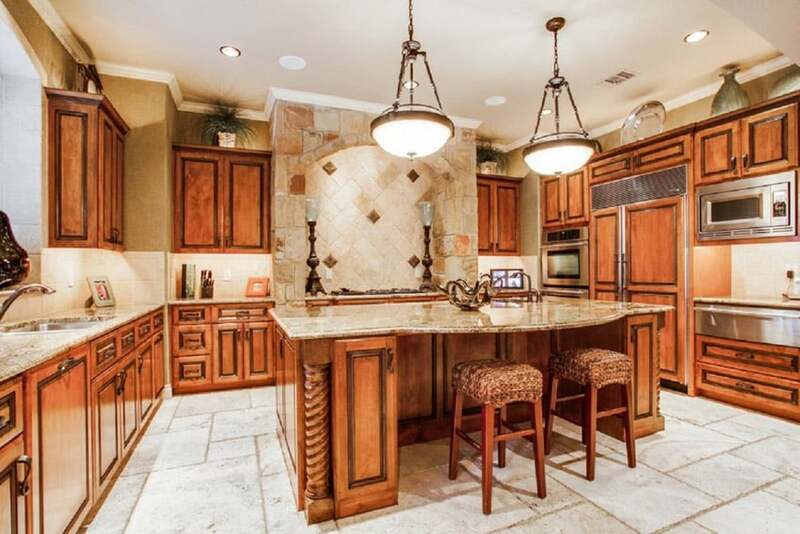 This kitchen has traditional white shaker cabinetry with rich wood flooring and upscale stainless steel appliances. The backsplash is an offset white square tile with a rectangular inlay. 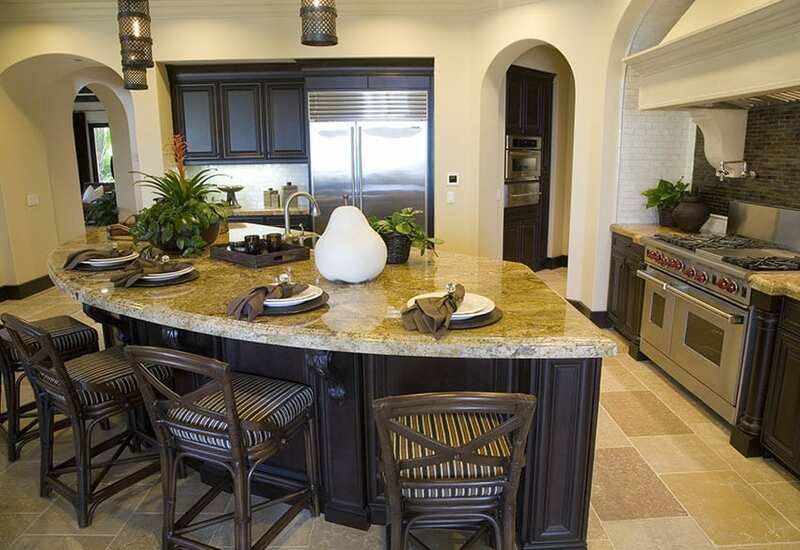 The long island and main kitchen area has countertops of Sienna Beige granite. 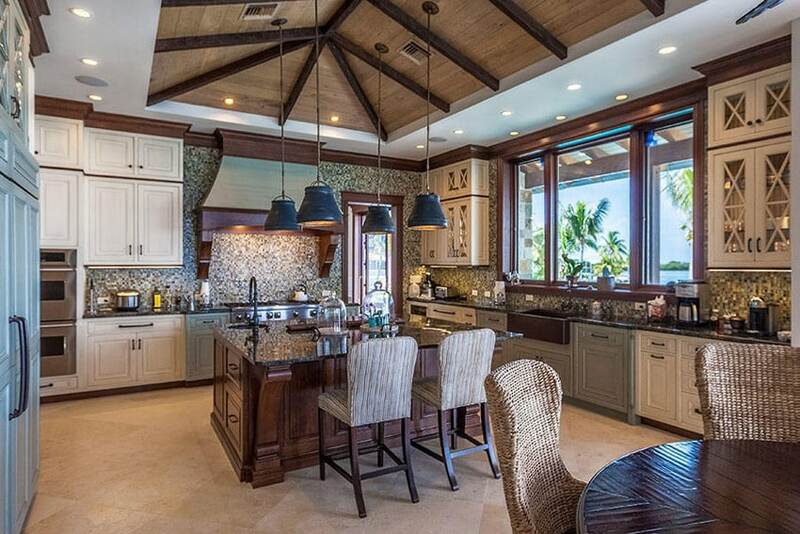 Along with recessed lighting, there are three contemporary design circular shade lamps suspended over the island. 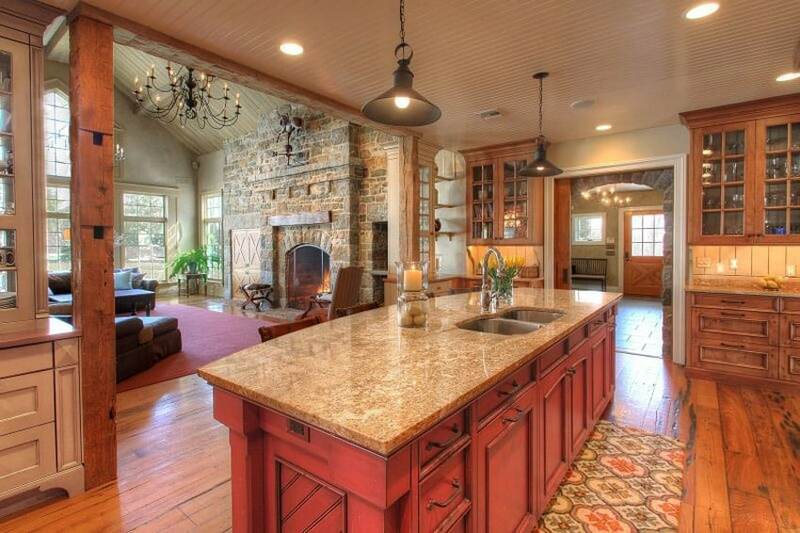 The open layout of the kitchen looks on to the living room with its beautiful stone fireplace. The kitchen itself features three types of wood for it cabinetry. 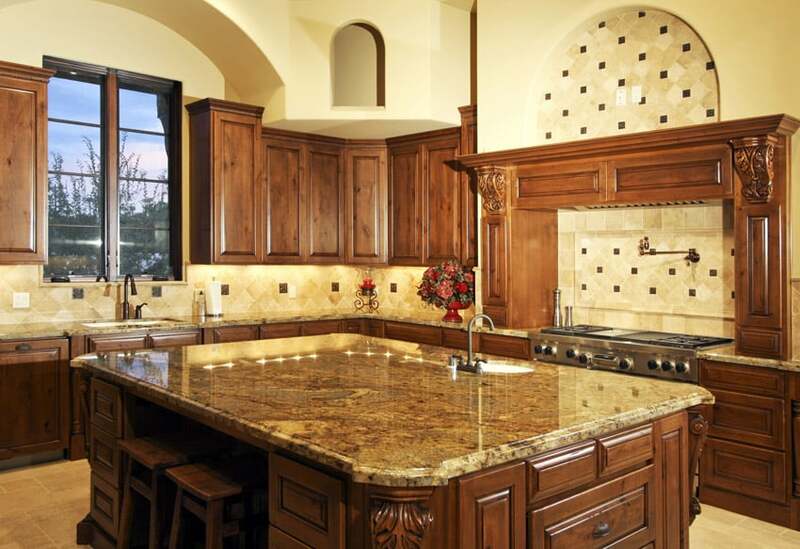 The center island is topped with a light brown granite with an under-mount sink. 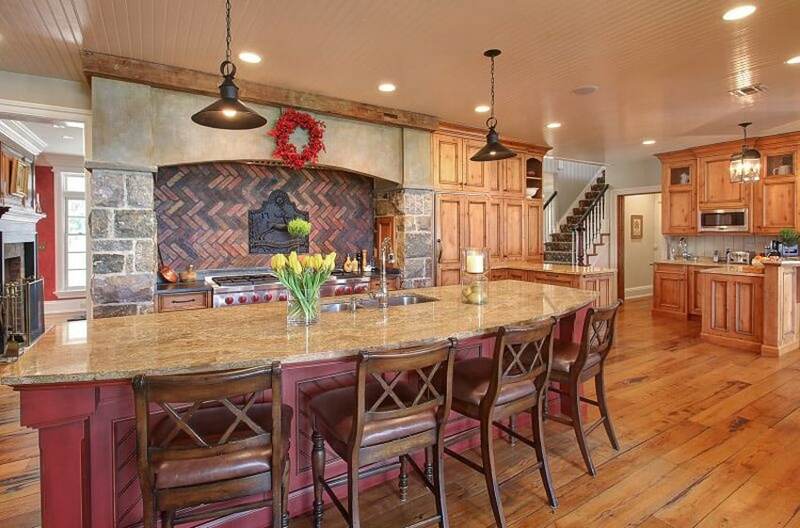 The wood plank floors and rustic cabinetry give this traditional kitchen a warm feel. This is a traditional country-style kitchen which uses natural finish Oak kitchen cabinets. The natural finish of the kitchen cabinets gives it a sort of rustic appeal which goes very well with the yellow wall color and the maple wood floors. The kitchen island/bar counter area uses gray finished wooden base to add a subtle variety of finish to the space while still maintaining the over-all vibe of the space. This kitchen plays with varying finishes, colors, and style to achieve a classic and elegant kitchen that is also equally modern feeling. 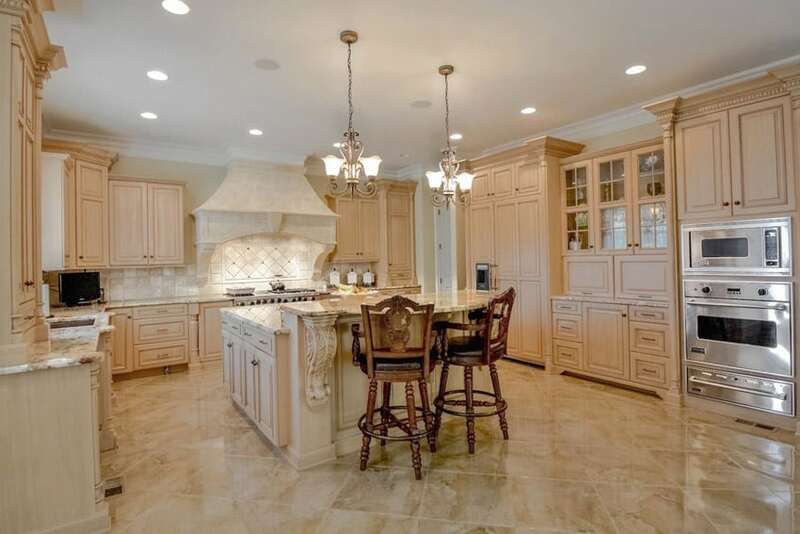 The walls are heavily covered with a big white cabinet on the left side and overhead and base cabinets on the wider side, parallel to the kitchen island. The outer overhead cabinets are vertically longer and is covered by a glass window panel instead of solid white wood. The oven and stove lies in the middle. A beautifully blotched brown solid stone in a glossy finish clads the backsplash, the same color to the kitchen island’s countertop that lies above a solid black base that is also a good match to the four pendant lights above it. Four chairs in a wooden frame and leather upholstery are aligned to allow sitting by the kitchen island. 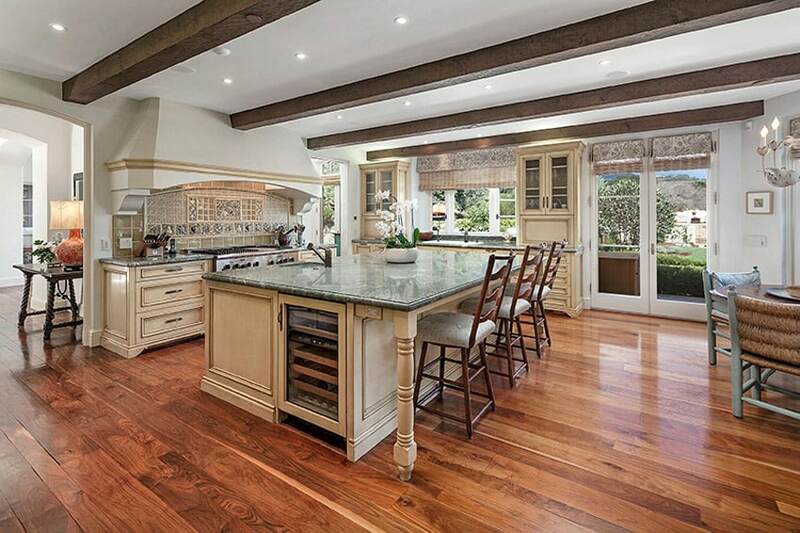 This spacious kitchen is adorned with varying shades of wood that all match to create an elegantly designed kitchen. 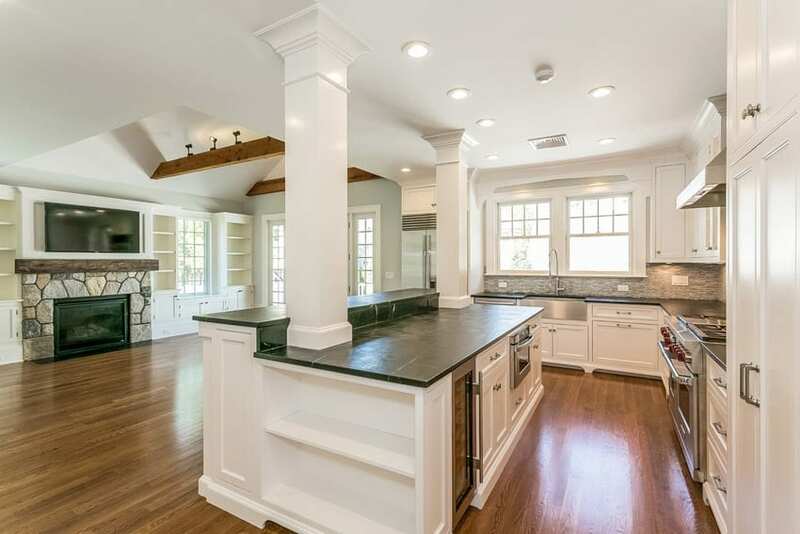 The exposed wooden trusses by the ceiling are thick and has a cold green tone with a matte finish.The cabinets by the outer corners and the base of the kitchen island are made of wengue-stained wood with a glossy finish while the remaining cabinets are white and paneled, with soft mint green lines on the base cabinet. The backsplash is well illuminated and is covered with brown marble stone of a lighter shade compare to the kitchen island’s countertop. The flooring is lined with a warm and deep mahogany laminate with a glossy finish. Vertical wood slat details used on the kitchen cabinet doors give this kitchen a country kitchen look. The cabinets were painted in an antique yellow color, giving it a slight yellowish green tinge. Counter tops are in black granite, while thr backsplash tiles are matte white painted bricks, giving it a more modern look. A modern penthouse apartment with a classic style kitchen. Walls were painted in a light mocha color and paired with sandstone floors in satin finish. This provides a neutral background for the combination of kitchen cabinets. The main cabinets are in white, while the kitchen island is in dark wengue finish. Aside from that there is a separate bar counter which accommodates 4 bar stools. Its counters are in white, while the built-up bar counter has black slate stone cladding and uses beige granite counter top all throughout the kitchen for a more uniform look. Other classic elements includes the wrought iron pot rack and some wooden candle-holders. Another kitchen placed in a modern space, the white walls and the light white-wash wood-look tiles give a light and refreshing feel to this kitchen. The lines and clean smooth in the mahogany paneled cabinets used and has no visible door pulls/knobs for a cleaner look. For the counter top, gray salt & pepper was used, while the back splash uses diagonally-arranged matte ceramic tiles which almost blends in with the off-white walls. This modern kitchen has a unique shape and layout as it doesn’t have the standard rectangular or square shape. It also has a excellent natural light due to the presence of large openings and skylight. 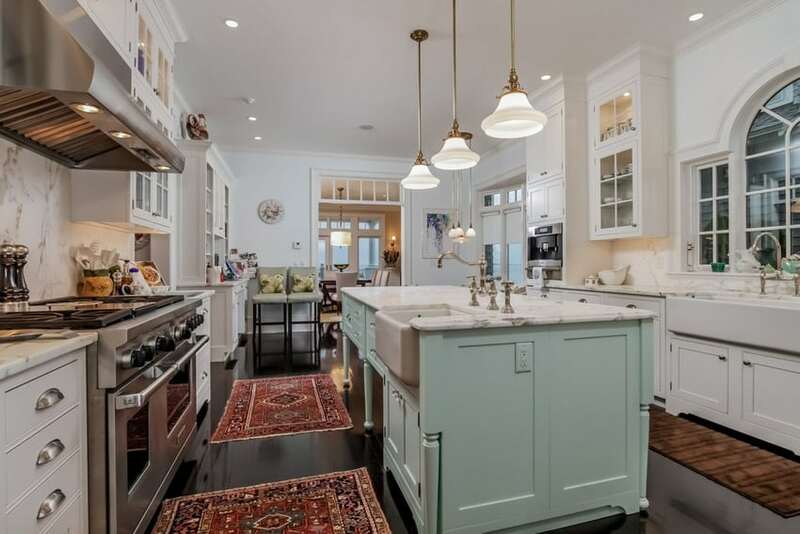 So despite the use of dark mahogany floors, this kitchen still looks bright. The kitchen has a circular flow, utilizing all available wall space, and for the finish, white was the choice of color paired with black galaxy granite and marble. The backsplash tiles used are white glass subway tiles for that modern retro feel, and there’s also an overhead pot rack in gold finish. The over-all planning of the space provides an efficient workflow and enough working space for food preparation. 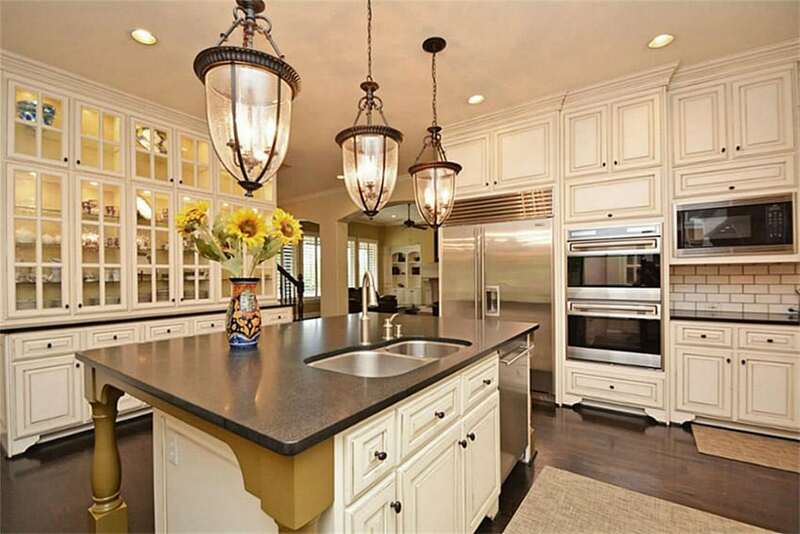 This elegantly classic kitchen has paneled white overhead and base cabinet that has small aluminum knobs. The stove’s stainless steel finish adds class to the solid brown marble countertop, as led lights under the overhead cabinets amply illuminate the diagonally line matte square tiles in an oatmeal color that clad the backsplash. The slight differences in color and the alignment gives it a really good texture. 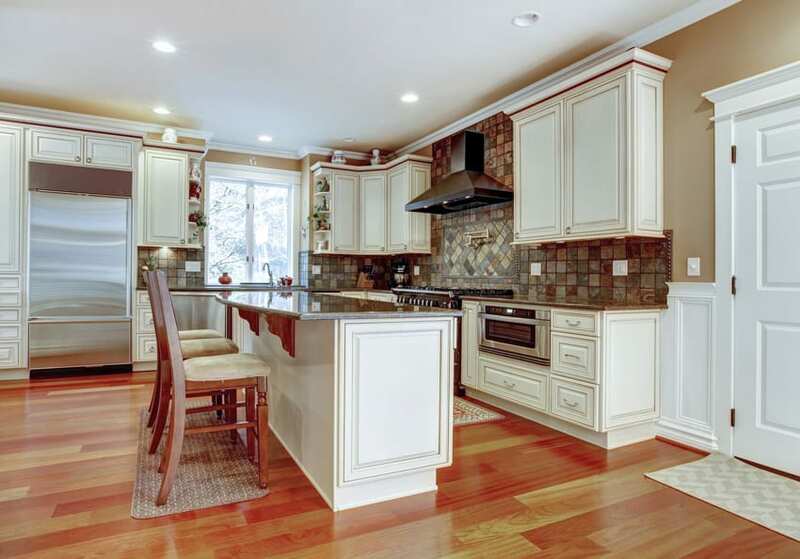 This kitchen goes for a more uniform look as it uses the same wood tone for both the floors and the kitchen cabinets. 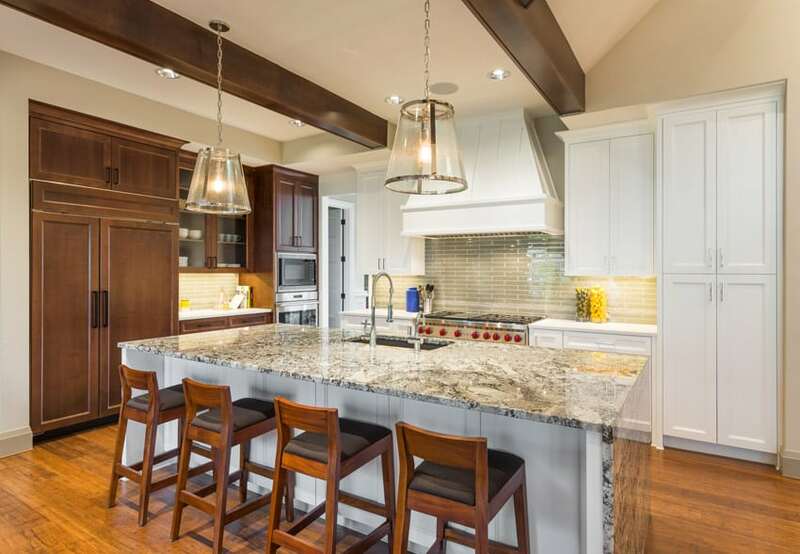 The floors uses gorgeous solid cherry wood, while the kitchen cabinets are all in cherry wood finish topped with black granite for the kitchen island beige granite for the main counters. One wall is utilized for pantry storage, ref and an oven counter, creating an efficient use of available wall space. 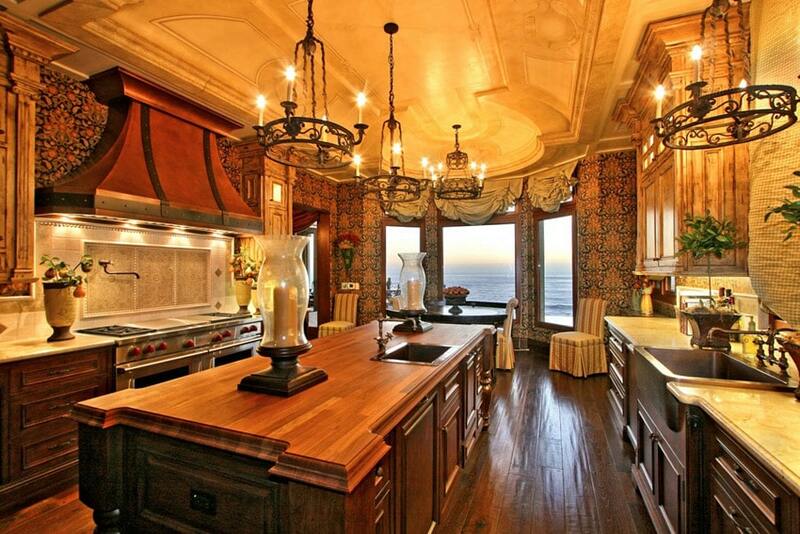 This kitchen is a definition of classic elegance. The beauty of natural wood finish is really highlighted in this space, as wood is found not only on the kitchen cabinets, but also on the floors, door and window frames, as well as the ceiling. Floors uses a more modern engineered wood floors in Maple, while the ceiling uses Teak wood planks and solid wood exposed ceiling trusses. The kitchen cabinets are natural walnut with gorgeous panel and carving details, elegantly paired with carrara marble counter top. The L-shaped kitchen island gives the kitchen a more modern update by using glass panels on the base cabinets, as well as glass shelves, to display some china items. 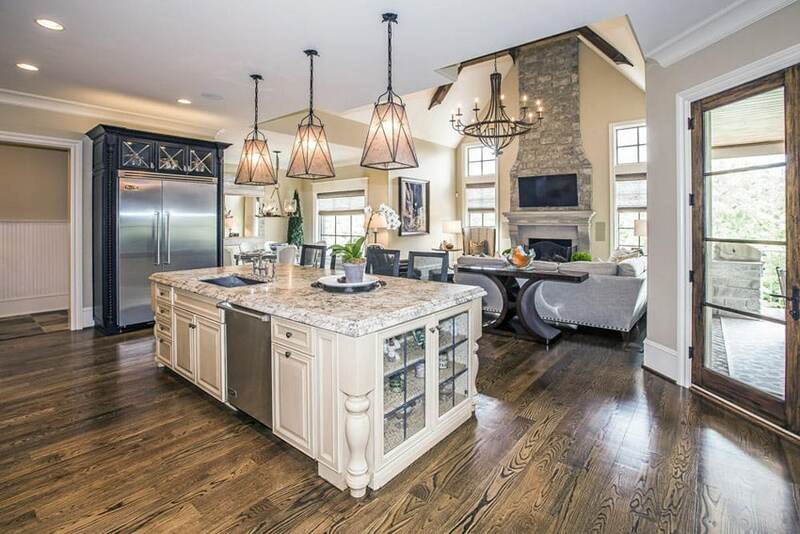 This traditional style kitchen is placed in a unique semi-open space. Its main cabinets are in Walnut finish, giving it hat classic elegance, while its two-level kitchen island (one is a working kitchen island and the other is a bar counter), uses teal-painted base cabinets with solid light oak counter top, giving the kitchen a fun and modern update. This kitchen island not only adds a pop of color to the space, but gives it a fun, younger vibe, yet manages to maintain that traditional appeal. Light maple wood kitchen cabinets look gorgeous with the light beige-painted walls. It gives that classic elegant appeal of traditional kitchen cabinets, but look a little more laid back against the plain painted walls. 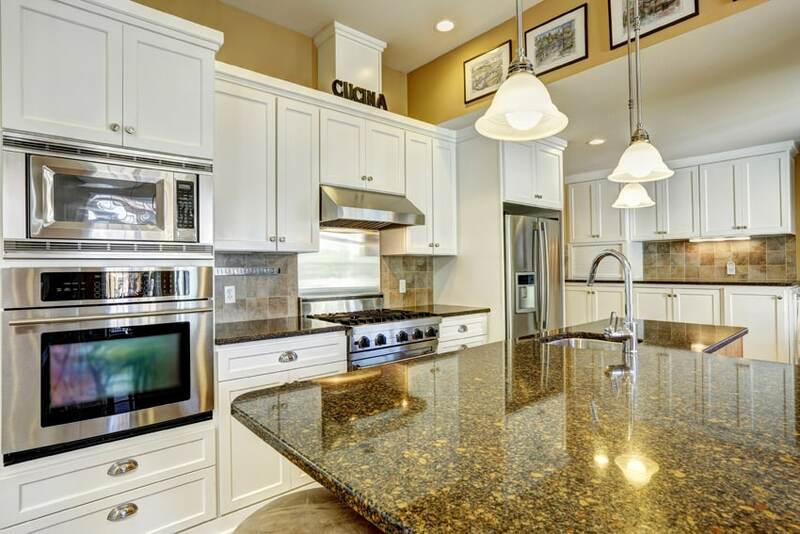 Granite counters are yellow and is paired with stone back splash tiles. The kitchen island provides space for 3 leather-upholstered bar stools, and you will also see wrought iron elements on the walls and on the accent lights. This kitchen is definitely based on traditional kitchen design styles, using solid American Walnut cabinet doors and natural stone counters for both the countertop and the backsplash. The solid wood doors gives the kitchen an elegant feel, and the modern kitchen appliances were all perfectly built in to the cabinets, and even the large fridge was concealed inside the cabinets in order to create a seamless-looking kitchen. The unique element of this kitchen would probably be the finishing of its cabinets. 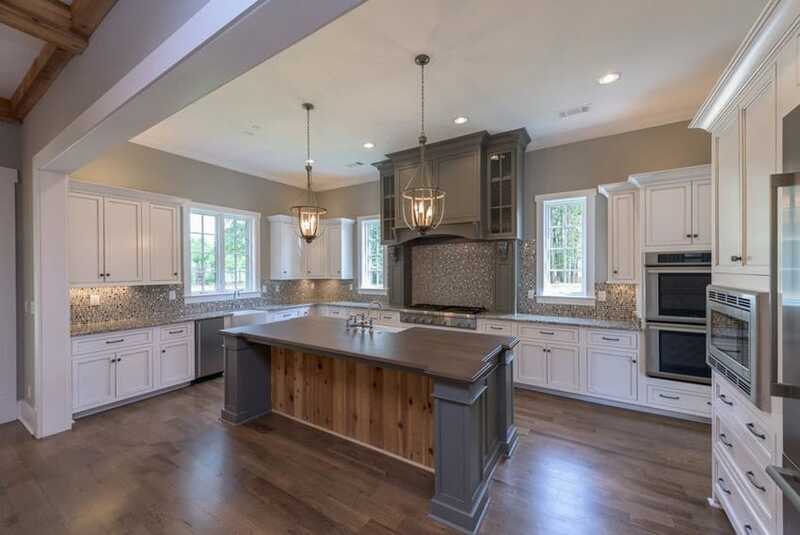 Beech wood cabinets were stained to achieve a cherry wood finish, while its moldings were stained in a darker wengue color, emphasizing the molding details and also creating an interesting pattern throughout the kitchen. All counters uses beige granite to create a more uniform look. 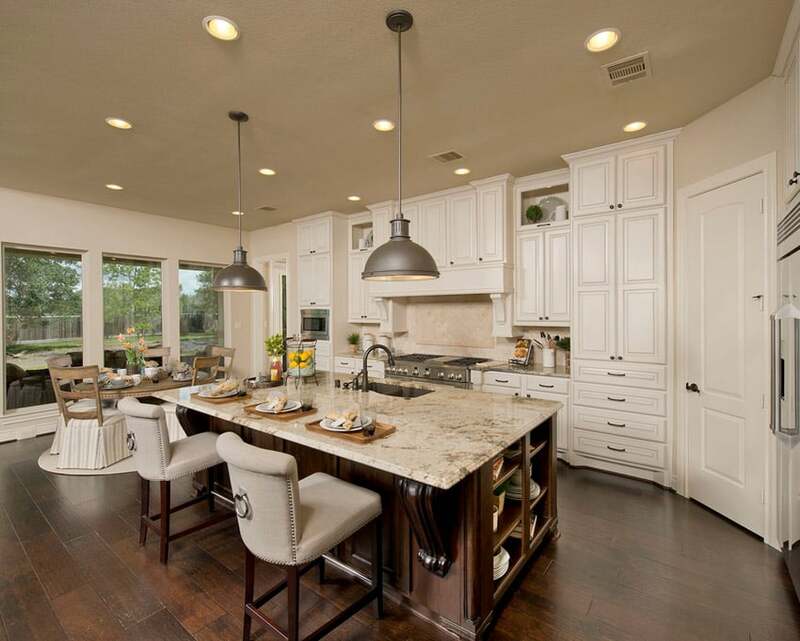 Space is definitely maximized in this transitional style kitchen space. Floors are in dark mahogany which helps bring out the white kitchen cabinets with panel details. One wall of the kitchen is utilized as a display cabinet, with a base dedicated for pantry storage. The kitchen island on he other hand has turned legs finished in a unique gold color and topped with black quartz. 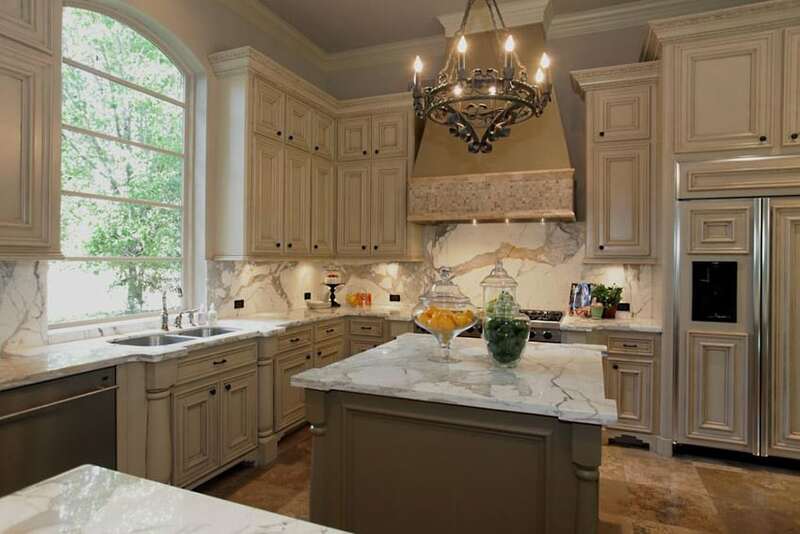 The charm of classic, traditional-style kitchens is very timeless. In this example, you will see that the kitchen cabinets are of traditional style with classical details and motifs, all in dark wengue duco finish. For the countertop, cream granite slab was used, combined with black brick-style mosaic backsplash tiles and white subway tiles which adds texture and a more interesting feature. You will also notice that the hood cover of the cook range is finished in white instead of wengue, making it stand-out among the dark-colored cabinets. This beautiful open plan kitchen features an l-shaped island topped with white marble and has a grey color cabinet for its base. The main cabinetry of the space is in white with a shaker style. A large stainless steel oven complete with oversized stove hood are set off to the side and surrounded by cabinetry. Engineered light wood flooring, recessed lights, and elegant pendant lighting help keep thing bright. Traditional kitchen designs often have decorative cabinetry with detailed scrollwork and edges. The kitchen cabinets in this photo are in light maple finish with turned legs and classic molding details, topped with elegant emerald green granite counter top. Since the cherry wood floors are already of a bold color, the walls and ceiling were kept neutral, painted in white and has exposed wood trusses in dark walnut finish. The kitchen is fairly small, but looks bigger as it has an open layout. 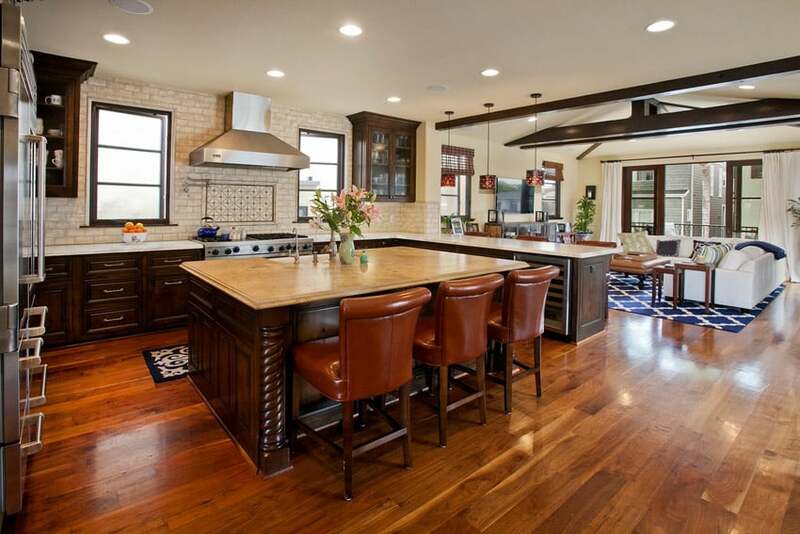 The large kitchen island provides a kitchen bar counter space for 3 ladder-back mahogany stools. The use of traditional-inspired white kitchen cabinets against the sage green walls and the vintage tiles gives this kitchen a romantic appeal. The white really goes well with the green walls, creating a light and soft look to the space, while the black granite counters adds a welcomed contrast to the space. The white-painted bar stools with rush seats adds a country-inspired element which also looks amazing with the vertical panels used on the sides of the island counter. Despite the use of traditional paneled cabinets, this kitchen has a more rustic appeal as the cabinets are painted in white, which offsets it from the Cherry wood floors. Counter tops uses black granite and paired with slate back splash tiles to give a dark contrast against the beige walls and white cabinets. This kitchen has a more modern transitional look. 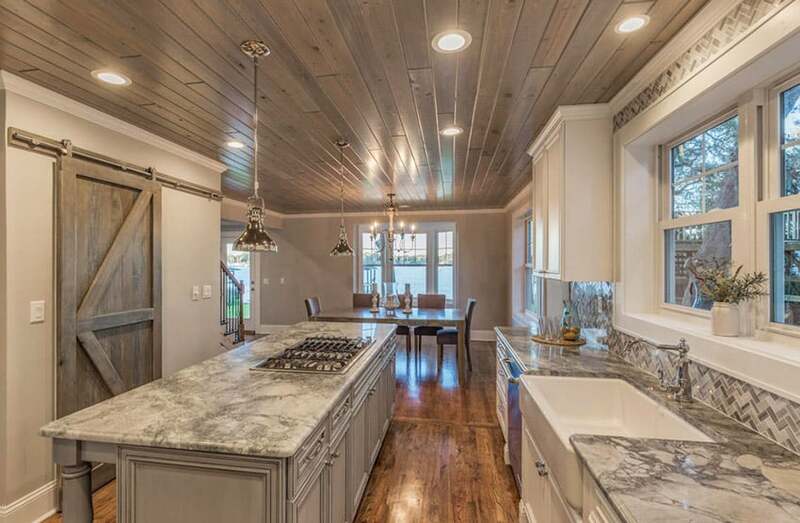 It uses traditional style paneled kitchen cabinets with gray salt & pepper counters and pairs it with gray painted walls and dark stained wood floors. The presence of stainless steel elements and even the industrial style bar stools give the space a more modern feel. Another transitional style kitchen which draws its inspiration from traditional kitchen design. The overall design has a lighter feel thanks to its choice of finishes. The simple profiled cabinets were painted in a matter white color and paired with gray solid surface (main counters) and light oak butcher’s block (kitchen island). These finishes, combined with light gray walls and natural oak floors combine to create a light and bright kitchen design. A traditional country-style kitchen which uses white-painted kitchen cabinets combined with natural antique finish wood kitchen island. The white main kitchen cabinets gives a refreshing modern appeal to the space, and gives a light and casual feel to it, while the antique finished kitchen island adds a rustic feel to the space. Traditional kitchen designs that have the right mix of modern and classic are highly sought after by homeowners. The kitchen cabinets and island in this image have sharp and straight edges giving them a more modern feel. While the overhead and base cabinets are solid white, a good contrast to the backsplash that is clad with matte gray rectangular tiles that are alternately aligned diagonally. The countertop is a deep gray glossy stone with touches of blue and white, just like the countertop of the wide kitchen island with a blue base. The floor contrasts the warm shades with a gray carpet that has yellow, orange, and red patterns. 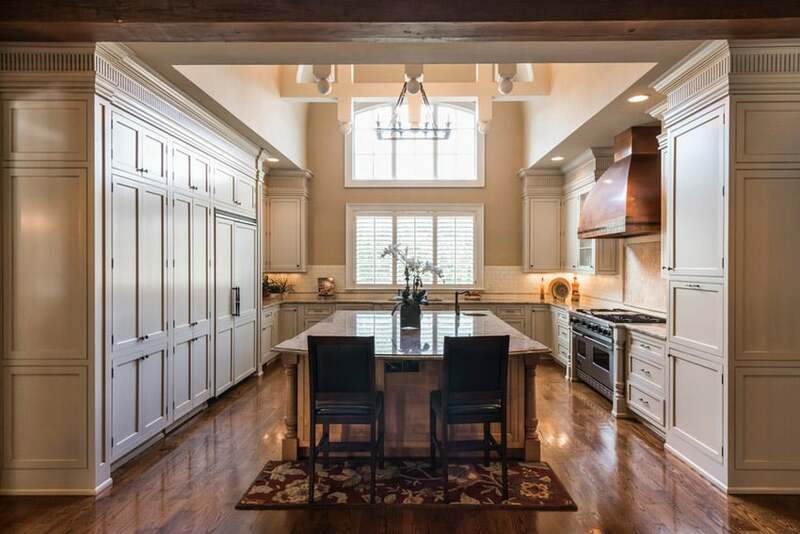 Modern meets traditional with this transitional style kitchen. The architecture of the space is definitely modern with its large picture windows and off-white walls and ceiling and wood-look floor tiles. The kitchen on the other hand are modular cabinets but has a traditional profile and has a white paint finish, while the kitchen island uses a darker Mahogany finish. The counter top material is light cream granite which looks good with the light beige-upholstered bar stools. The black finish hardware and fixtures, as well as the metal drop lights helps enhance the modern transitional look of the space.